Next Monday, we are going to have a crew at our house doing pretty extensive foundation work. Our home, like many in Charleston, is built on the side of a hill. Eventually, gravity takes its toll and begins to slide those hillside houses down the hill. So, in preparation for the work, I have to move 3 of my bee hives which are fairly close to where the work will be done. Bees are highly visually oriented. They note the location of their hive by the landmarks they identify as well as the very look of the entrance of the hive (no, believe me, I have asked my bees!) Shortly after bees emerge, they do a few tasks but quickly begin to take orientation flights in front of the hive. I can always tell when they start as there will be a big swarm of bees hovering in front of the entrance as if they are approaching the hive. Each day, they do this for 15 or so minutes and then they are done for the day. So, to move a hive is to totally mess up all of that training. Most folks suggest that if you have to move bees, you move them several miles away so that the bees have nothing in the least bit familiar about which to orient. Indeed, if you carry bees several miles away, they will reorient and find the new location of their hive when they take their first flight after the move. Some people make the mistake of simply moving their bees a few feet to a few hundred feet and they find that the bees return to the original location (to which they are oriented) after their first flight out of the hive at its new location. Of course, that presents a problem. I don’t want to move my bees miles away for the 2-3 days while the workers do their thing on my foundation. I also can’t just move the hive 100 feet to a safe location. Luckily, I am the bee-whisperer. I talked to my bees and they said, “well silly, just force us to reorient in our new location.” I always move my bees at night (which is a dangerous proposition by itself). The bees should all be in the hive at night. That means there is more weight and more stinging insects. It also turns out that bees know they aren’t supposed to be out at night so if I mess with them, they take offense. In fact, generally the only things that disturb bees at night are bears. They react to beekeepers in the dark as they would a bear…unpleasantly. By moving them at night, however, I can be assured that all of the bees are in the hive and I won’t leave stragglers. 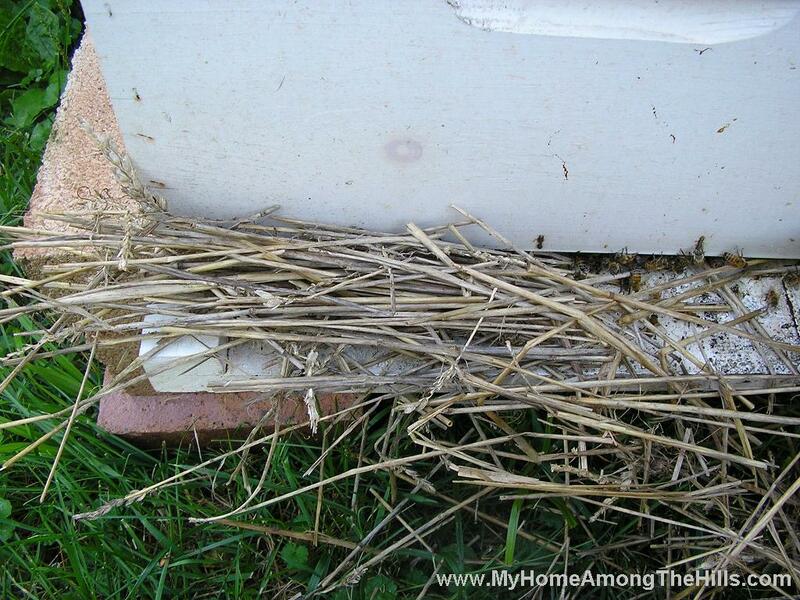 I simply move the bees to the new location and then stuff grass, straw, sticks, etc into their entrance. When they come out the next day, the immediately know that something is different so they reorient to the new location. Without the stuff jammed in their entrance, they apparently never notice the difference. Anyhow, I have moved bees many time using this method and never had a problem with them returning to the old location. You are the bee whisperer, but I think you needed to whisper a little louder last night. They were not very pleased about being moved. I’m glad I was inside for the relocation! Very interesting! Thanks for sharing, warren. Now just how does one buzz and whisper at the same time? Very interesting. I hope I never have to move our hives. .-= Chiot’s Run´s last blog ..Making Pickles =-. No but seriously, do you really talk to your bees? .-= YDavis´s last blog ..This Week =-. That is so cool. I had no idea they were so oriented to one place. Thanks for the tutorial. Maybe one day I’ll actually be able to use the information. Could you be a husband whisperer too? Convince mine that bees are okay to have around the house? .-= Ceecee´s last blog ..Brain Drain =-. Emily – no kidding…good thing I wasn’t barefoot like I usually am! YD – I surely do! inadvertent farmer – most beekeepers are afraid to move their bees. Even our state inspector tells people to move them miles away. I have only ever moved them with the reorientation plan so I don’t really know first hand what happens if you don’t follow those rules…it probably doesn’t matter so long as most bees are in the hive when you do it…but I don’t want to chance it. Ceecee – bees are pretty easy going…not really a hazard, esp if you have a little space…not much really. I have 3 on as little as 1/4 acre and they don’t bother the neighbors. I hope you were all suited up for the relocation. I hope your foundation work goes smoothly. .-= Evil Twin’s Wife´s last blog ..True Confessions III =-. Neat that the stuff-stuffed into the crack is necessary for them to reorient. I so want bees. .-= tipper´s last blog ..Making Blackberry Jelly – The Old Time Way =-. Hi! I just found your blog via Chiot’s Run. I’d like to have bees in the future and look forward to reading more. Thanks! .-= Kristin´s last blog ..DIY Laundry Supplies Part 1: Detergent =-. ETW – I hope the foundation stuff goes well too…holy cow have I seen a lot of people having work done lately…dang WV hills!